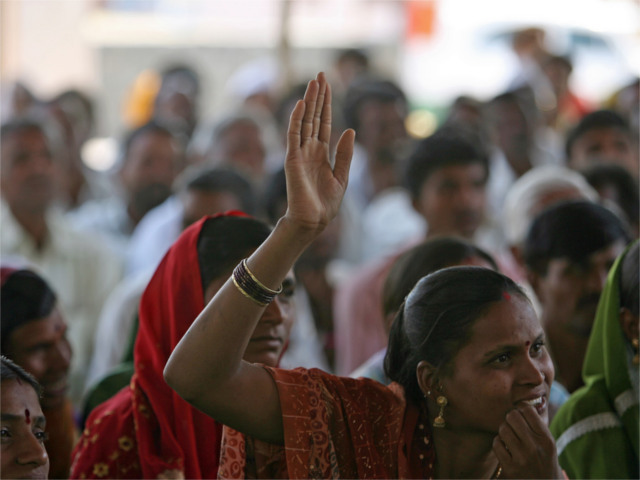 A woman raises her hand to speak at a community meeting in Aurangabad, India. Photo by World Bank Photo Collection. Public transport is a core part of our daily lives. It is an economic driver — linking commuters to employment opportunities and bringing potential customers to retail and commercial establishments. It impacts our health, as modes of urban transport affect the air we breathe; our safety when we walk, bike, and commute; and our physical fitness. Transport is, in short, a fundamental part of life for most of the world. As the world becomes more urban, transport will play an even more important role in our lives in the future. Too often those who utilize public transport on a daily basis are not brought into the decision-making process or consulted on its operation. This lack of participation may damage public use and endorsement of mass transport. The public can offer valuable insight on how a transport system should be designed. Including the public in the design process from the beginning, and following through to solicit input during the operation stage, can help to build support for a project and avoid costly and time-consuming petitions of protest from the public. The advent of the internet is making it easier than ever to solicit public input. Once commonly associated with dispassionate town hall meetings, public consultations are evolving as public agencies embrace the internet as a communications tool. Traditionally, governments hosted information sessions or town hall meetings to update the public on the impact of an infrastructure project on the community and to receive comments in a forum setting, one-by-one. The best an agency could hope to receive was a few comments from those who could attend that night’s meeting. Attendees tend to self-select, and agencies would only receive input for a small subset of the population. With the advent of the internet, new surveying techniques are helping to make it easier for the public to offer comments in a decentralized, user-driven fashion. The European Union, for example, has been soliciting input on transport projects online since 2005 and transparently providing summary reports on response trends written by a third party. In The use of internet for public consultation is not mutually exclusive with town halls and community meetings, which serve an important purpose in connecting the agencies directly with the public. In New York City, for example, the Department of Transportation hosted both 159 in-person community meetings and an online survey that received over 10,000 responses during its public consultation regarding its bike-sharing system, set to debut on Memorial Day next Monday. Many other cities and countries have turned to the internet as the easiest and widest reaching method of public consultation. As smartphones become more ubiquitous, public consultation may become even more decentralized, providing the public with the tools to comment real-time when something goes wrong at a specific intersection or subway stop. During the operations phase, smartphone applications could provide commuters with a platform to recommend improvements, effectively crowdsourcing some of the maintenance duties of the transport agency. Public consultation is not without its challenges. For one, all stakeholders are not alike. Most public consultations look to include all relevant stakeholders, but for large-scale infrastructure and transport projects, there can often be tensions between the “heavy” stakeholders involved in the project and the “end users,” the public. Stakeholders involved in the planning and financing process may have different interests from the commuters who ultimately use transport. It is incumbent upon the soliciting authority to weigh these inputs. That said, transparent, decentralized, open public consultations help to equalize he playing field and magnify the voice of the daily commuter. Another challenge is making public consultation work in the developing world. Public consultation in New York, where the population tends to be wealthy, connected, and fairly opinionated, is one thing; soliciting input in Mumbai, India, or Nairobi, Kenya, is another. The need for public consultation is all the more vital in the developing world, however, because it is unlikely that the public’s input will be adequately voiced without it. Along similar lines, difficulties can also arise when trying to implement a project in a region with historic heritage. It can be challenging to weigh completely different viewpoints on how land should be utilized. Lastly, the delicate issue of balancing a project’s need for urgency with its need for stakeholder buy-in is a challenge that can’t be ignored. Public consultation must be implemented at an early stage and factored into construction and planning timelines, so it does not unnecessarily delay implementation. Traditionally, when public consultation has been included in a project, it is incorporated during the planning process. This is natural, as the public should have a voice in how transportation projects are implemented in their neighborhoods, and there are big, impactful changes that occur during the planning stage of a project. The public should also be consulted, however, whenever significant changes to the operation of a transport system are implemented and periodically throughout the system’s operation. When a major schedule change is implemented on a bus rapid transit and light rail line, for example, it typically affects hundreds of thousands, if not millions, of daily commuters. Likewise, periodic public consultation can help to reveal ways to improve the user experience — often at low cost to the operator. Public consultation is useful throughout the life of a transit system and should not end when the last slab of concrete is set, or the last track is laid. Constant feedback from the public can help improve the experience for commuters, and help improve the transport projects that governments plan and construct.